Kick off 2017 with a Salmon Feast! The perfect way to toast the New Year is with this delicious salmon recipe provided by our Dock Manager Ryan Ashton. Hopefully you’ve managed to save a few pieces of your delicious salmon catch to enjoy in 2017! With the fresh texture and taste so well preserved by our in-house vacuum packing service, you can enjoy exceptional fish dinners all year ‘round! Although not a traditional holiday meal, salmon can be a great addition to a festive menu. 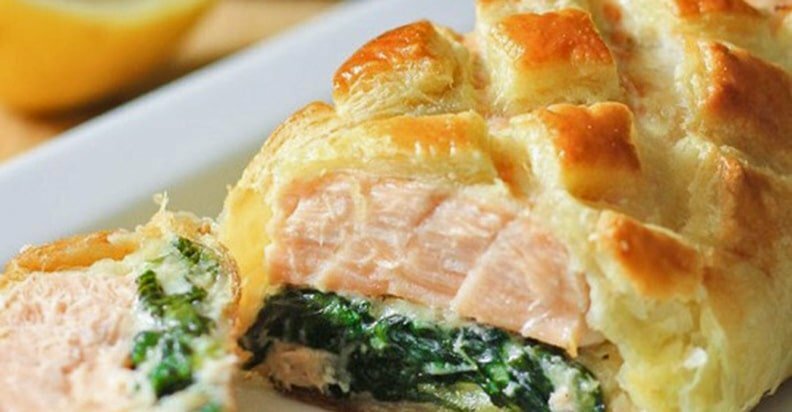 One of my favorites is Salmon Wellington – a west coast twist on the well-known beef wellington! If you still have some QCL salmon left in your freezer, why not give this recipe a try? Lastly, add the spinach, bread crumbs, and Parmesan cheese. Sauté just until the spinach softens. Unfold the puff pastry onto a light floured surface and roll out the 2 sheets, then cut them in half, so you end up with 4 pieces. Each piece should be about 10 X 14 inches. Bake at 350 degrees Fahrenheit for 25-30 minutes or until the pastry is golden brown. Wow, this is incredible. I would love to forward to friends but there is no forward option. Just a suggestion to add one. Thank you! Sounds and looks delicious! Looks great and will try your receipt real soon. Seasons Greatings.